Be forewarned, followers of sheikhs, imams, ayatollahs, amirs, caliphs, ulama, mu'attilah, aalims, mujtahids, mullahs and muftis, be forewarned! These Thieves of Truth have deceived you. Again we say to you - be forewarned! So Peace during the present, ongoing Al-Qiyamah (Al Qadr, the Night of Power and Fate) until the Dawn of Doomsday (Al Qariah the Day of Noise and Clamour)! What is the (Day) of Noise and Clamour? And what will explain to thee, what the (Day) of Noise and Clamour is? Will be in a Life of good pleasure and satisfaction. But he whose balance (of good deeds) will be (found) light - Will have his home in a (bottomless ) Pit. And what will explain to thee what this is? (It is) a Fire blazing fiercely! "6251. The Day of Noise and Clamour is the Day of Judgement, when the whole of the present order of things will be overthrown with a tremendous convulsion. Cf. n. 6235 to 99:1, and n. 6096 to 88. All our present landmarks will be lost. It will be a stunning experience to begin with, but it will inaugurate a new world of true and permanent values in which every human deed will have its true and just consequences, as if weighed in a balance. 6352. Moths are frail light things. To see them scattered about in a violent storm gives some idea of the confusion, distress, and helplessness in which men will be at first overwhelmed on the Day of Account . .
6353. Cf. n. 5682 to 70:9. The mountains are solid things, which seem as if nothing could move them. But in that tremendous cataclysm they will be scattered about like flakes of teased or carded wool." The Calamity! What is the Calamity? And mountains will become as carded wool. Ah, what will convey unto thee what she is! - Raging Fire. The terrible calamity! What is the terrible calamity! And what will make you comprehend what the terrible calamity is? And the mountains shall be as loosened wool. He shall live a pleasant life. His abode shall be the abyss. And what will make you know what it is? A burning fire. 15. Ah woe that Day to the Rejecters of Truth! 2. to be an indication of; signify n 1 something that portends an event about to occur, esp. an unfortunate event; omen"
"defer to put off to a future time; postpone; delay"
Webster New World Dictionary, Third College Ed., Simon & Schuster, 1988. "DEFER, POSTPONE, SUSPEND, STAY mean to delay an action or proceeding. DEFER implies a deliberate putting off to a later time." The above are two distinct and different periods, one preceding and warning about the other. The Night of Power and Fate (Al Qadr) precedes and warns about Day of Noise and Clamour (Al Qariah). Yet more than a billion Muslims are oblivious to His Mercy and are not even aware the Resurrection is taking place i.e., The Day You Were Not Aware (Al Rum), exactly as prophesied in the Qur'an! This deceit is surely the work of Satan who promised Allah that he will mislead humans. And he has succeeded brilliantly as hundreds of millions will not believe that Allah in His Mercy has sent messengers to proclaim the Night of Power and Fate, the Day that defers the portents of the calamitous End or Day of Sorting out. So be forewarned, unbelievers, be forewarned! Laylatul Qadr is a celebration to commemorate the arrival of the final guidance for humans, and not just Muslims. It is a tribute to the commencement of the Divine Message revealed to mankind by their Creator, a message which shows them the way to achieve happiness in both the worlds. The commencement of the Ressurection is a bringer of joy, fulfilment and great spiritual powers. Laylatul Qadr is a bringer of light and guidance for humankind. Unlike the birthday which is celebrated with a feast for the senses, Laylatul Qadr includes a feast for the spirit, a feast of worship, prayers and meditation on His Ruh within. It serves as a great awakening to all the Believers, irrespective of race, religion and creed. 78:18; the Day the Trumpet will be sounded. Trumpet; Day of Allah." Why is Qiyamah (Resurrection) not even mentioned once in all the following surahs concerning Judgment Day (The End) i.e., Al Qariah (Day of Noise and Clamour)? 101:1-11; noise and clamor; Good and Evil rewarded." — Will the Rise of the Morn commence the Day of Noise and Clamor (surah 101:1 - 11 Al Qari'ah)? — Will the Day of Noise and Clamor end the Peace of the Night of Power? — Will the Wrath of Judgment Day end the Mercy of the Resurrection? — Will humans flee in confusion, distress, and helplessness during the terrible Judgment Day? — Will mountains crumble and skies crash during the awesome End? — Will those souls who rejected the Qiyamah be rewarded with the Blazing Fire? — Isn't the Allah's Blessings of Qiyamah better than His Wrath of Judgment Day? — And what will explain to the Muslims what the Night of Power is? — And what will explain to the Ummah what the Day of Noise and Clamor is? Human beings, these are the Days of Resurrection! So now do you know? Jinns and beings, these the Days of Resurrection! So now do you know what the Night of Power is? Ummah, these are the Days of Resurrection! So now do you know the difference between Allah's Mercy and Punishment? Guardians of religious regimes, these are the Days of Resurrection! So now do you know the difference between Allah's Love and Wrath? Followers of false preachers, these are the Days of Resurrection! So now do you know the difference between Allah's Paradise and Hell? Hindus, Christians, Jews, Muslims, Buddhists and Sikhs, these are the Days of Resurrection! So now do you know the difference between Allah's announced Good News and the sudden Calamity and End? Fools and idiots, these are the Days of Resurrection! So now do you know the difference between Allah's True Believers (Al-Mu'minun) submitting to the Night of Power and the Kafarah (Disbelievers) defiant till the Terrible Calamity? So now do you know the difference between Allah's messengers calling to witness the Resurrection and those deceived by Satan defying and returning to their families in conceit? So now do you know the difference between Allah's messengers calling to witness the self-reproaching Spirit and those deceived by Iblis defying the Plan of Allah for all humankind? So now do you know the difference between Allah's sending His Spirit Shri Nirmala Devi during Al-Qiyamah and Jesus Christ during the Second Coming - the End? But Ye - Ye Were Not Aware! Thus were they used to being deluded! And this is the Day of Resurrection: but ye - ye were not aware!" But if thou bring to them any Sign, the Unbelievers are sure to say, "Ye do nothing but talk vanities." Thus does Allah seal up the hearts of those who understand not. Nor let those shake thy firmness, who have (themselves) no certainty of faith. Be forewarned, followers of sheikhs, imams, ayatollahs, amirs, caliphs, ulama, mu'attilah, aalims, mujtahids, mullahs and muftis, be forewarned! These Thieves of Truth have deceived you. Again we say to you - be forewarned! So Peace during the present, ongoing Al-Qiyamah (Al Qadr, the Night of Power and Fate) until the Dawn of Doomsday (Al Qariah the Day of Noise and Clamour)! 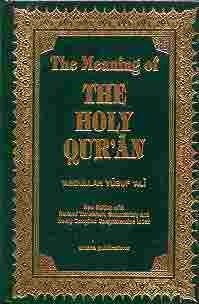 In Abdullah Yusuf Ali's commentary Kufr, Kafara, Kafir, and derivative forms of the word imply a deliberate rejection of faith, revelation and truth of the Holy Qur'an: "The culmination of Allah's Revelation is in the Qur'an, which confirms previous scriptures, corrects the errors which men introduced into them, and explains many points in detail for all who seek right worship and service to Allah—whether they inherit the previous Books or not. It is a universal Message ... The worst and most hardened sinner is the man to whom Allah's Signs are actually brought home and who yet prefers Evil and turns away from the Light of Allah. The Signs may be in the words and guidance of a great Teacher or in some sorrow or warning, but from which he deliberately refuses to profit. The penalty—the Nemesis—must necessary come eventually." According to Ibn Taymiyah (1263 - 1328) "kufr is the attribute of everyone who rejects something that God has commanded us to believe in, after news of that has reached him, whether he rejects it in his heart without uttering it, or he speaks those words of rejection without believing it in his heart, or he does both; or he does an action which is described in the texts as putting one beyond the pale of faith." Only now in this modern age of universal education, mass media and publishing technology—after 14 centuries and unlike the illiterate past—is it possible to own and be sufficiently literate to "study the Quran carefully" in languages they understand best. * And just in case the Believers start studying the entire Qur'an, it must be stressed that Allah (SWT) is referring specifically to those eschatological Signs and surahs upholding His Call to bear witness of the Resurrection! They must thoroughly examine and understand the Signs that have already manifested, and set forth by messengers from amongst themselves. Once I happened to meet a fellow, a Muslim from Bosnia and he told Me, "I want to die for my religion, for God's sake." I said, "But why? Who told you to die?" He said, "Now, if I die in the name of God, I'll be resurrected." I said, "It's all wrong. That's not the way it is going to work out. Resurrection is going to work out this way that at this time, all these souls will take their birth. All these souls will take their birth and they will be resurrected. As human beings they'll have to come." That's why we find all kinds of funny people these days, all kinds of cruel, criminal, all kinds of idiotic, stupid, I mean very queer, weird, funny ideas which find such, such a variety of people and such a tremendous population that we should understand they have to have their chance of Resurrection. But how many will come? That's the point. How many are going to come?" — "If your mother tongue is not Arabic, Satan (or his troops) will encourage you to read the Quran in Arabic. Why does he do that? Because he knows that you will not understand enough of it. The majority of those who learn Arabic to study the Quran do not excel enough to understand the implication or interpretation of certain words when used in a special way in the Arabic language. They will have a lot of shortcomings. Many Pakistani and Indian Muslims are forced as children to read the Quran in Arabic and still as adults read the Quran in Arabic but they do not understand a single word of what they read... The Quran is a message, not just another beautiful language book. If you cannot read it in Arabic do not wait until the day you excel in your Arabic language, because this day may never come. Trust God and know that He is the teacher of the Quran. He will teach in any language and to any nationality, He created all things. Read your Quran today, (do not wait any longer,) in any language that you can understand and master and leave the rest to God." Dr. Rashad Khalifa, Ph.d.
"This Makkan surah describes the Judgement Day as the Day of Clamour, when men will be distracted and the landmarks of this world will be lost, but every deed will be weighed in a just balance, and find its real value and setting. Of the great Day of Account. And men will be helpless like scattered moths? Alas, in a blazing Pit of Punishment." "The striking Hour. What is the striking Hour? And what will make you know what is the striking Hour? It is a day whereupon mankind will be like moths scattered about. And the mountains will be like carded wood. Then as for him, whose balance (of good deeds) will be heavy, he will live a pleasant life (in Paradise). But as for him whose balance (of good deeds) are light, he will have his home in 'Hawiyah'. And what will make you know what it is? (It is) a fiercely blazing Fire."." "The striking Hour. What is the striking Hour?." 'Al-Qariah' (the striking Hour) is one of the names of the Day of Resurrection, like 'Al-Haqqah' (the Reality), Al-Tammah (the Day of Recompense), As-Sakhkhah (the Day of Second Blowing of Trumpet) and Al-Ghashiyah (the Overwhelming). "As if they were locusts spread abroad." [54:7]. "Then for him whose balance (of good deeds) will be heavy" On that Day all good and evil deeds will become clear. One whose good deeds overweigh hi evil deeds will live a happy life in Paradise. And the one whose sins outweigh more heavily on the scales will be thrown headfirst into Hell. 'Hawiyah' is one of the names of Hell. That is why it is said: "An what will make you know what it is?" Then He (swt) says that is a fiercely blazing Fire. Ash'ath bin Abdullah said that after the death of a believer, the angels take his soul of the other believers and say, "give solace to your brother. Till now he was in troubles." Now those noble souls ask him, "How is so-and-so?" He replies, "He is dead. Did he not come to you?" They understand the fact and say; "He was taken to his abode Hawiyah." Allah (swt) says that the Fire is of extremely high heat with raging flames. Muhammad (saw) said, "Your fire is the seventieth part of that Fire." The Sahabah (ra) said, "Even it is enough to destroy one." Muhammad (saw) said, "Yes, but that has sixty-nine more equal parts of heat." Ahmad ibn Hanbal reported that Muhammad (saw) said, "This fire, despite its being seventieth part of Hellfire has twice been extinguished in the ocean. Had it not been so, you could not have benefited from it." In another hadith, it was said, "This fire is a hundredth part of the Hellfire." And Tabarani narrated that Muhammad (saw) said, "That Fire is seventy times darker than even the smoke of this fire of yours."